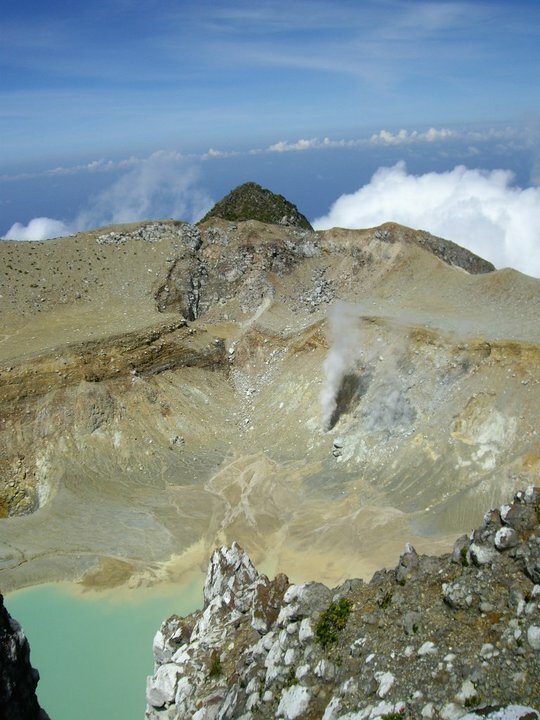 Egon is a very active volcano and is one of the most popular hikes on Flores. 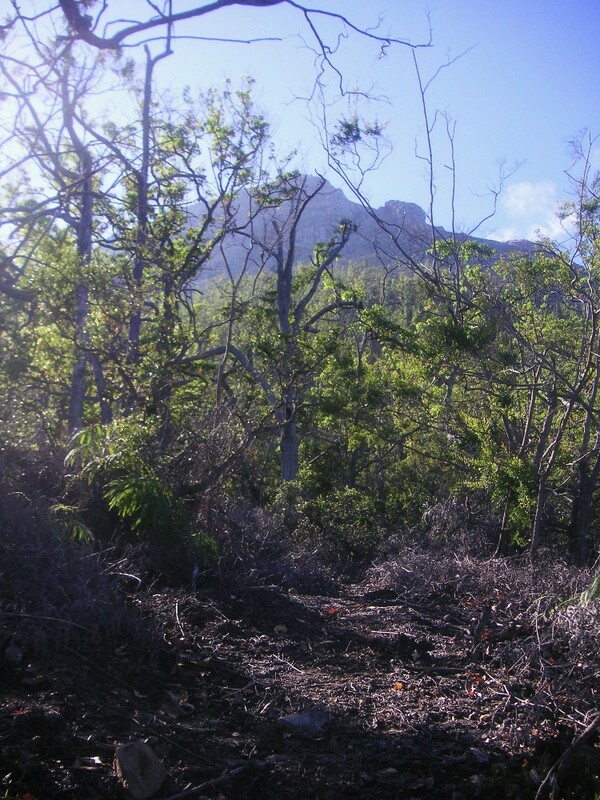 The last major eruption was in 2008 and it covered sections of the trail with ash and debris making it difficult to find. Thankfully the trail is now reasonably clear once more but finding the start of the trail (beyond Blidit village at 788m) is difficult without a GPS or local guide because there is no signpost whatsoever! 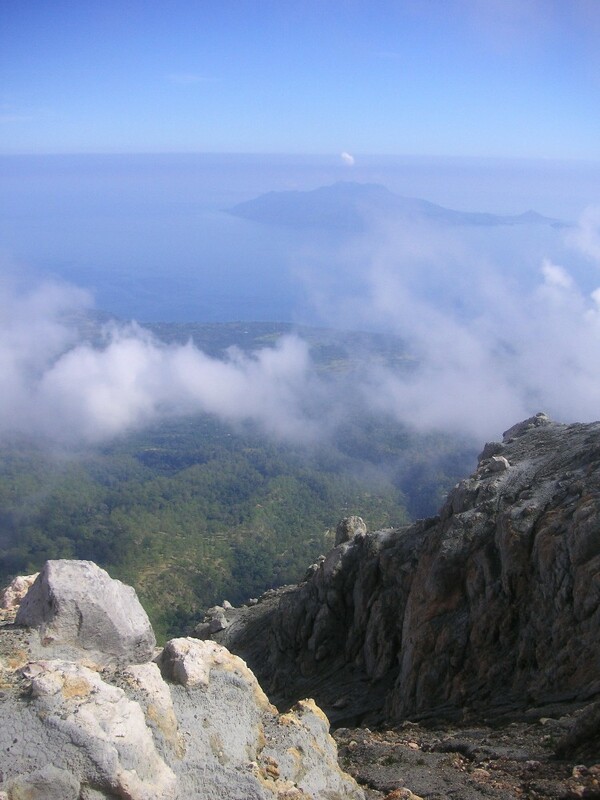 It takes about 1 hour to reach by car from Maumere – head east on the main road towards Larantuka and take the road leading up the hillside at Waigete (WGT on road markers) which does actually have a signpost for Gunung Egon, alebit only visible from the eastern side. This road leads up to the starting point 8km up the hillside which is home to some of the friendliest locals in Flores. Expect lots of greetings! The trail leads through open woodland offering some excellent views of nearby island Pulau Besar in Maumere bay. The woodland ends at 1,328m and the trail zig-zags up increasingly steep and increasingly rocky terrain. 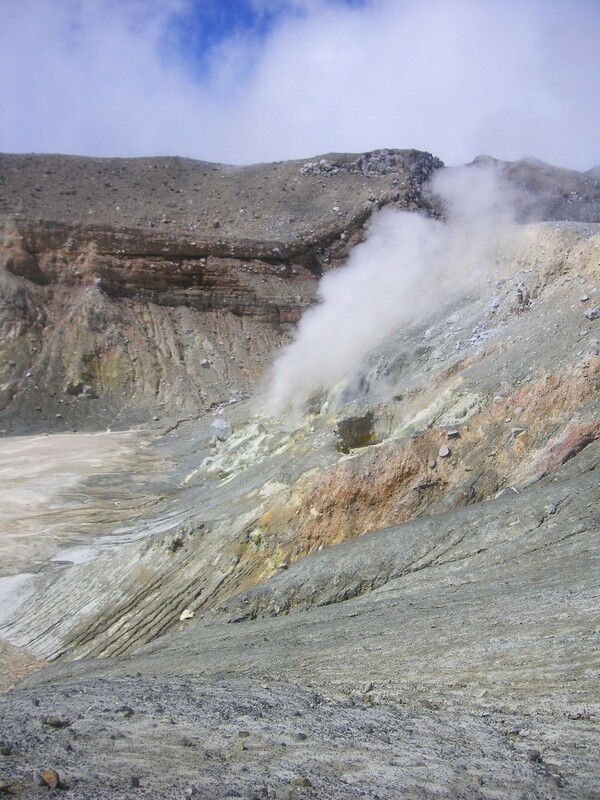 You should soon be able to smell the sulphur in the air. Every year local people throw chickens and other things into the crater in an attempt to placate the volcano but it remains the most fearsome on Flores so caution is needed. 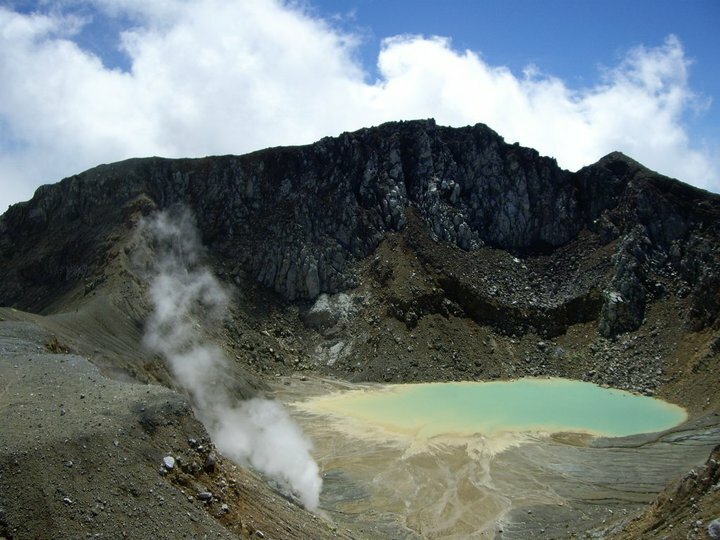 The trail becomes more vague and a little more difficult as you negotiate volcanic scree beneath the impressive crater cliffs. 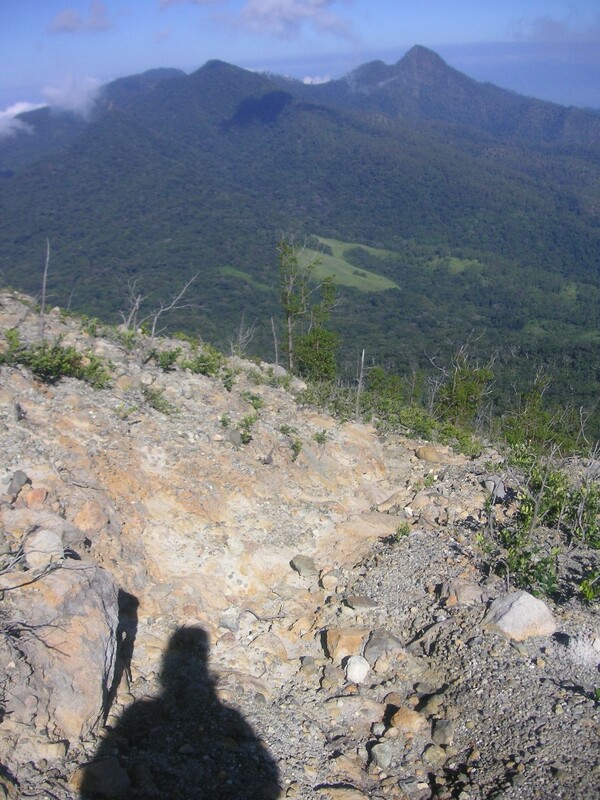 The trail then flattens out and leads over loose, damp volcanic sand to the lowest point of the rim (1,598m). 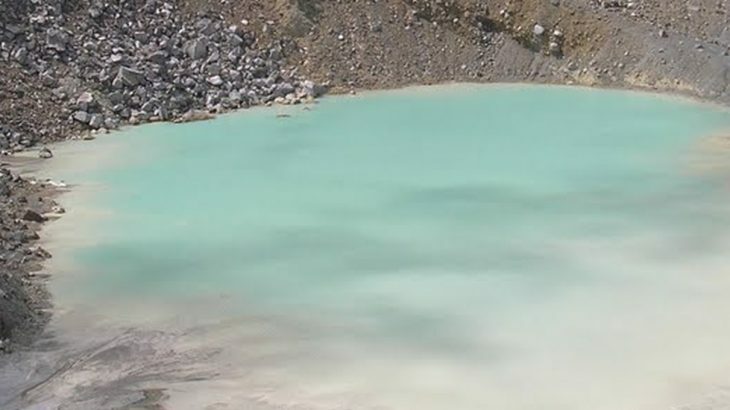 It takes no more than 3 hours to this point and views to a very active and noisy fumarole and the beautiful blue lake are delightful. This is about as far as most people come, although it is quite easy to stroll up to the right onto higher parts of the flattish areas of the rim. 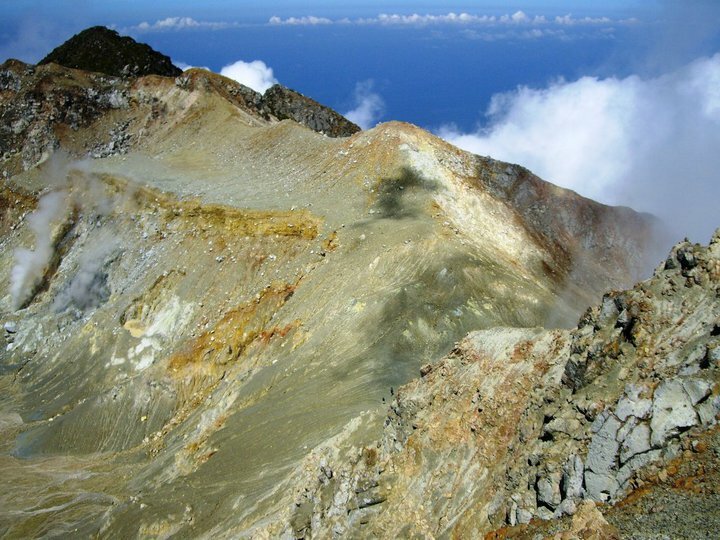 You should see several metal pipes half-buried in the volcanic sand – these are remains of a Japanese sulphur mine. This is about as far as most hikers come and all guides will warn you not to climb the final 100m up the steep summit cliffs to the left. Unless you are a confident rock climber it would be a bad idea to attempt what it a rather technical scramble/climb. The near-vertical slopes of soft crumbly rock and wettish sand are very hazardous indeed and a fall he.re would result in serious injury if not death. It is beyond the ability of most hikers. A small number of experienced climbers have reached the highest point – including Englishman Rob Woodall who made a full, leisurely circuit of the rim in just one hour in August 2010. The highest point of the rim is marked with a few large rocks. Further round the rim is a near-vertical drop of 5m (ropes may be useful here) and a very narrow arete made of soft mud – very dangerous indeed but possibly easier for the suitably-experienced climber to negotiate and then make a full circuit of the rim rather than descending back the same way down the steep cliffs. On the way back down the same route your guide will probably encourage you to leave some small change to express thanks for making a safe return at a special area just off the trail (1,173m) where there is a small metal plate. Getting there: There are several flights per day from Bali’s Denpasar to Maumere. 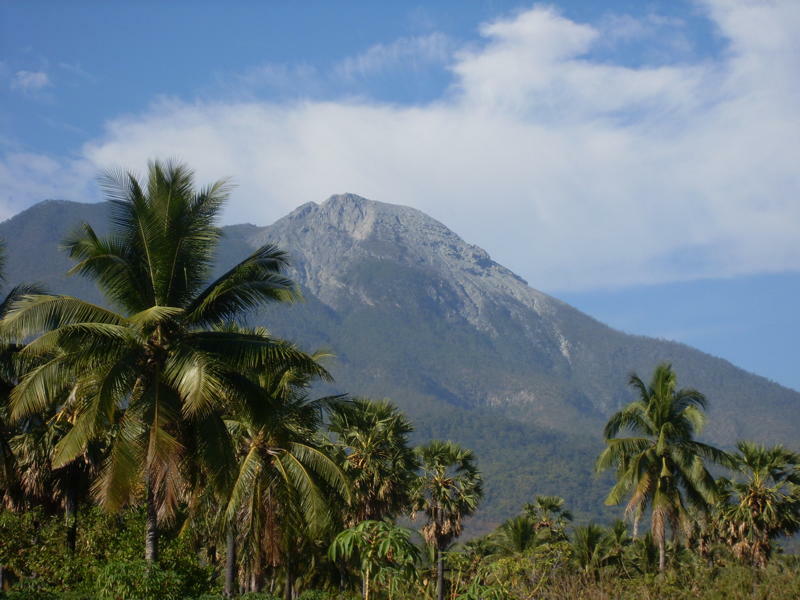 Accommodation: The nearest town is Maumere where there is a good selection of places to stay. Water sources: None available – take sufficient supplies with you. Egon means ‘big’ or ‘strong’ in local Sikkanese. We hiked Gunung Egon in May 2017. Took a motorcycle ojek from our accommodation, so they dropped us off right at the trail start. The first part of the hike goes through very picturesque forest , the trail was very easy to follow. There are nice views over Pulau Besar and Pulau Babi. The crater was dry and had couple fume holes. Its very scenic volcano. We went part way around the rim, did not want to risk climbing the steep mountain, and return the same way back. As we wanted to check out the hot springs, we walked down the road for good hour before finding the side trail, it took us longer then we expected but the creek was a pleasantly refreshing. Then we caught a local villager with a motorcycle to take us back to our place. Egon is very scenic volcano and quite easy for fit hikers. Climbed Egon in April 17. I confirm that the path is still clear and marked up with cairns up to the rim. The access is pretty straightforward, pass Blidit village and follow the road for less then 10 minutes. Just before the road enters a more dense forest area, you will see a path going up into an open woodland area (as shown on the 3rd picture above). This is the beginning of the hike. It’s rather impossible to get lost on the way up. If you go a little bit too fast descending you might get off the path. As a rule if you haven’t seen cairns for more than 5 minutes you are likely to be off. Took me less then 2 hours to get to the rim. Weather was quite cloudy around 10:30AM. Clearer around 2PM in the afternoon. Climbed Egon today recent fires have wiped out most of the trees and brush from the road for several hundred metres upwards. This makes the track easy to see from the road and clearly visible going up. However with no trees to hold the soil in place the first several hundred metres of the track will be covered the first time any decent rain falls. Also crater lake has dried up completely. Did this trek fairly recently. Stayed at Sunset cottages, 250k/night. Basically, you need to rent a dilapidated motorbike from the guide there (100k + fuel) who then charged us 100k more for a group of 4 to show us the trailhead from a terribly rutted and run-down road. Its not easy to find, but its on Open Streetmaps and pretty obviously goes up to the left from the road. I think he wanted 250/300k total to guide us to the top, but ultimately wasn’t necessary. All the other info is pretty much right. All I’d add is that there was a slight breeze at the bottom but a raging gale at the top, like nothing I’ve seen, we could only just stand in it. Defintley ruled out going much further around the rim, sometimes when it clouded over we couldn’t tell which way to go. In July when we went, it seemed to be clear at dawn, cloudy after 8am at the very top, then clear after midday, for some reason. This pattern persisted for the 4 days we stayed on the beach nearby. Order lunch by phone or something on the way down. There is not a single other restaurant/eatery in the area until you get nearby Maumere, and most of the places on the beach takes an hour at least to cook even simple meals. Sunset did boxed lunch in metal containers on a later boat trip, thats probably a good option. Anyway, great climb, highly recommend it! Can you send me the contact details of the guide? Just found this nice website, we also climbed Egon, in June 2014. Very nice hike, while going up it was very foggy, but it cleared up somewhat when we reached the top for a nice view. We followed the track that’s on Open Streetmap, worked perfectly with a smartphone and as others have said it’s pretty obvious for the most part. We were the only people there for the whole hike. Weirdly there was no lake in the crater, even though Tihomir writes below there was one just a few weeks before we climbed it, but I checked our pictures. Seems to dry up quickly! We stayed in Ankermi Dive Resort, nice place on the rocky shore. The rented us a motorbike which we took to the start of the trail. Climbed Egon recently. There seem to be lack of accomodation in Maumere and the one that I checked were crazily overprized. 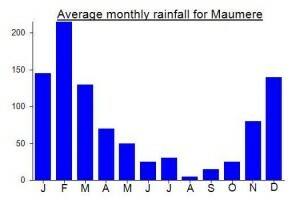 Much better option is to go 28km east of Maumere. There is a beach and two places to stay – Lena house and Sunset cottages (you can easily find telephone numbers by googling, owners of both places speak english). I stayed two nights in each of those places. Lena is little cheaper, cost 155000rp, 200000rp for Sunset cottages. Sunset cottages are little better and newly build (opened this year), but food is better and cheaper in Lena, so I’d go for that one. Also Lena has more Bungalaws, so you can meet more people to chat with. Beach is not cristal clear, but suitable to relax for a day or two. Both of those places can arrange ojek for Egon, cost 40000rp one way. You can also just take ojek in the morning to get there and walk back all the way, that’s what I did. Track is super clear, you don’t need guide or gps, nearly impossible to get lost. I didn’t try to reach the very summit, but you can walk around 2/3 of the creater rim safely for sure. 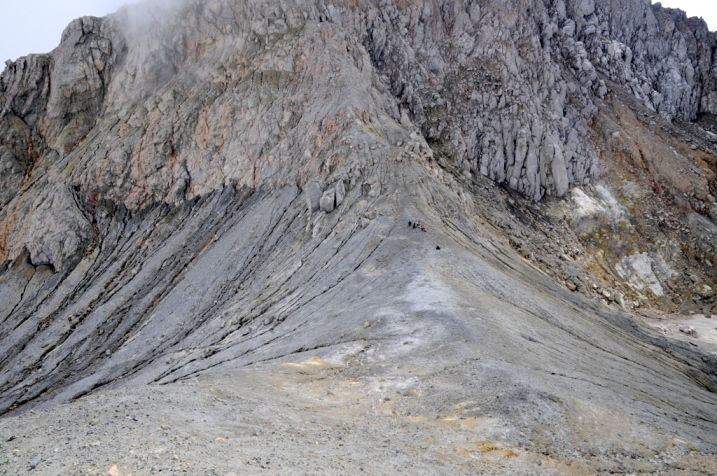 Overall, it’s worth going there, mini version of Bromo in Java. I climbed Egon in early May 2014 with a friend who had been there a few years earlier. He said the top had changed in the past few years. 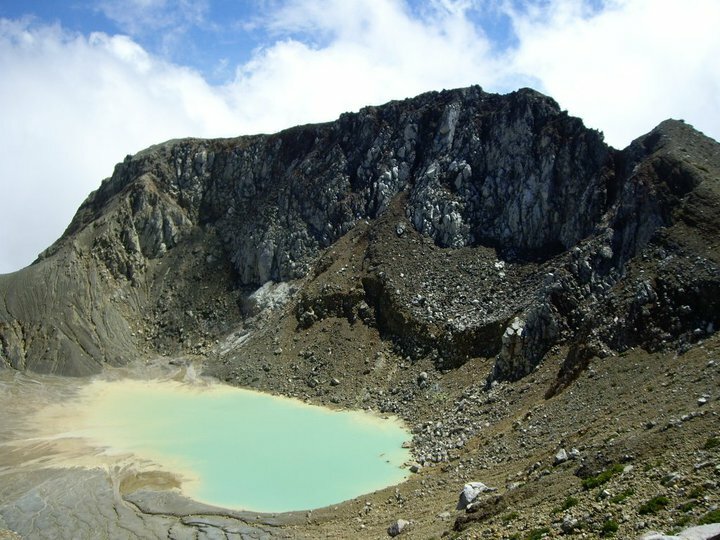 Now there was a lake at the bottom of the crater. Going down to the lake was not possible (or too dangerous) in my view. The climb is generally fine. I used the gpx file published here and no guide. A bit of scrambling and caution needed around the top. 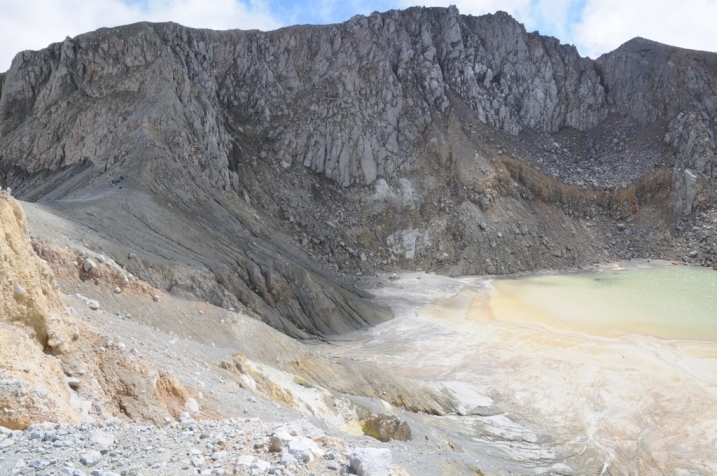 I was there yesterday, July 3 2011, and we took the “wrong” route to reach the crater. I call that wrong because its more dangerous then the route where we get down. on the rock we took the right side, it supposed the left side. we follow Thomas Ulrich’s route on GPS. 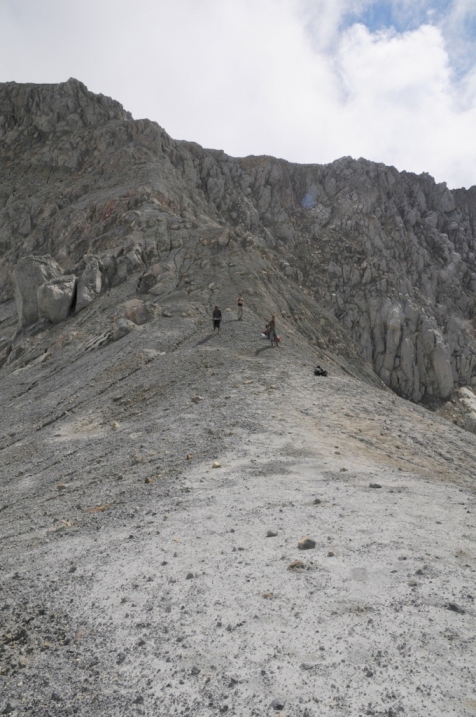 And from the crater we climb a litlle more higher, but can not reach the summit, because no equipment. but for sure i will be there next 2 weeks and reach the summit. I can confirm in additional to Rob Woodall and a mysterious Dutchman named Erik (who our guide told us about), Wolfgang Piecha also reached the true summit of the rim in April 2009 on a Java Lava hike – using the same route as Rob and (presumably) Erik. As did Thomas Ulrich (originally from Switzerland). See http://www.peakbagger.com/climber/ascent.aspx?aid=131204 for Rob Woodall’s account of his successful climb to the true summit! Sadly myself and Adrian weren’t confident enough on the steep, crumbly rocks to continue up to the very top.